Note: Prague State Opera is closed for renovation until Autumn 2019. Productions have transferred to the National Theatre, Karlin Music Theatre and the Estates Theatre. The Prague State Opera (Státní opera Praha) stages a varied programme of opera and ballet by Verdi, Tchaikovsky, Puccini, Rossini, Donizetti, Prokofiev and other well-known composers. Prague's foremost opera house is located near the top of Wenceslas Square, and is 15 minutes walk from the Old Town Square. The Prague State Opera opened in 1888, and with the Czech lands forming part of the Austro-Hungarian empire, it was named the New German Theatre. But it has changed name and ownership several times since, each change reflecting the political climate of the day. A significant change came at the end of World War II. The Czechs had regained control of their country. Opera, which had not been staged for several years, was reinstated, and as an expression of Czech national identity they renamed the opera house the Smetana Theatre, after their famous composer, Bedřich Smetana. However, the optimism was short lived. Within a few years Czechoslovakia became a communist state, a regime in which opera was considered elitist. Performances were rare and the building suffered neglect. The theatre's renaissance came in 1992 with the fall of communism. A name change to the now familiar Prague State Opera followed, and this magnificent theatre was brought to life once more with a regular programme of opera and ballet. Aside from the current period of renovation, the Prague State Opera has enthralled audiences ever since. For visitors to the city, a night at the opera house can be a highlight of their Prague trip. 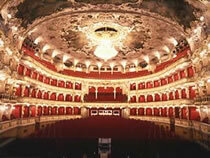 For listings and to book tickets for the Prague State Opera: opera and ballet.